Antonella expertly drives her heather-gray Opel through the tapestry of old town Cagli, traversing a narrow course of stone-paved streets. In the early July evening, the river beneath the bridge to New Cagli shimmers in the golden sunset. Antonella angles the car right, coaxing it up a tree-canopied lane toward the sports complex.Here, the drum corps, La Compagnia dei Tamburi di Cagli, practices for Cagli’s spectacular annual festival, the Palio dell’Oca. Revived in 1987 as a celebration of Cagli’s greatness, the Palio is a window into Renaissance life. Cagliesi dress in full regalia and relish tournaments, music, food, and jousts in a city festooned with elaborate decorations. Residents prepare enormous meals in pots the size of wash buckets. 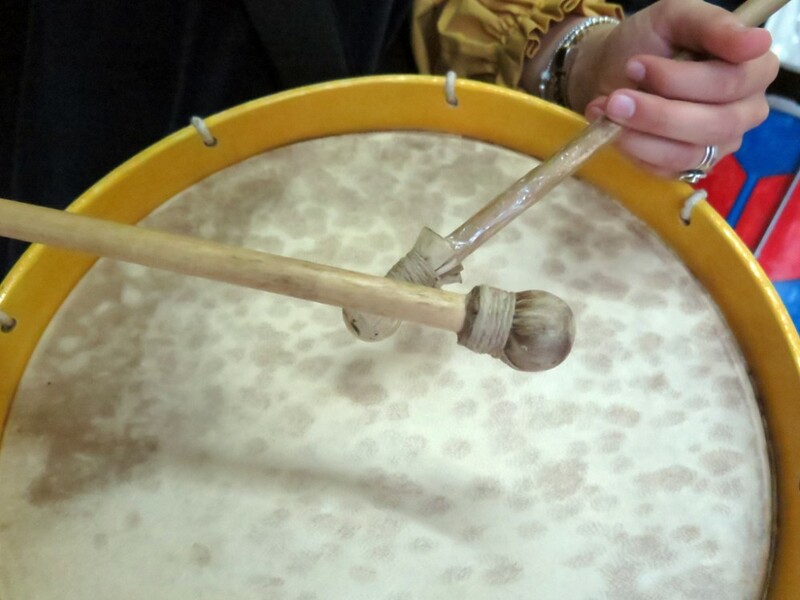 Everyone has a role, and the young people of La Compagnia have chosen the drum competition. Slipping out of her car, Antonella grasps her drum by its brown leather strap and sets it on the walk by the gym. A squat white cylinder with rims of banana-yellow and sky-blue, the drum sports a yellow-and-blue shield splashed with a red X. 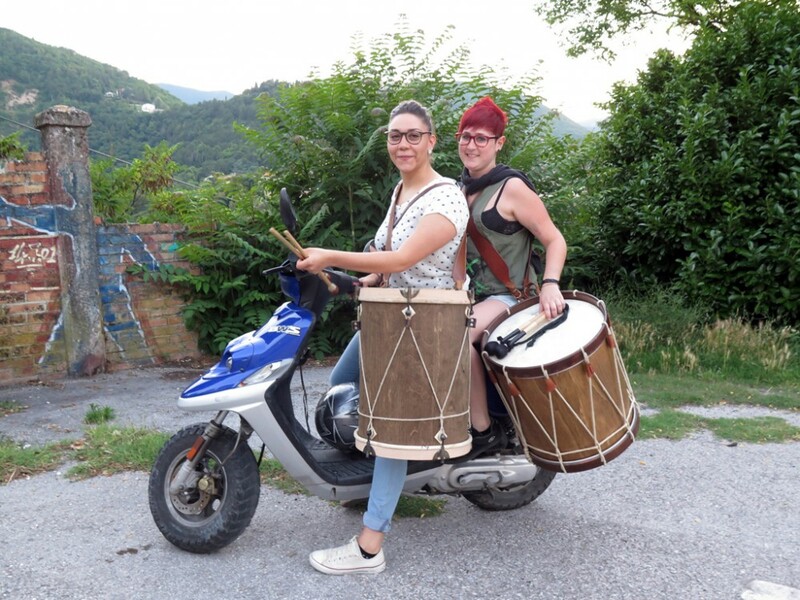 The buzz of an approaching motorbike signals the arrival of Chiara and Lucia and their brown-barreled, ivory-rimmed drums. 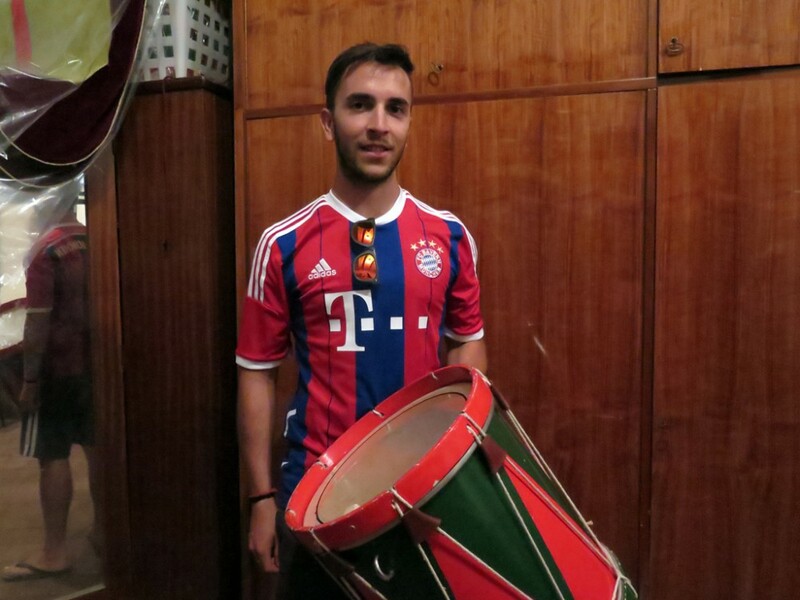 Soon, cars and motorbikes invade the lot, depositing a dozen 18- to 30-year-old drummers. The air is heavy with exhaust fumes, cigarette smoke, and the chatter of assorted conversations. Drums varying in size, shape, color, and age dot the spaces between gatherings. 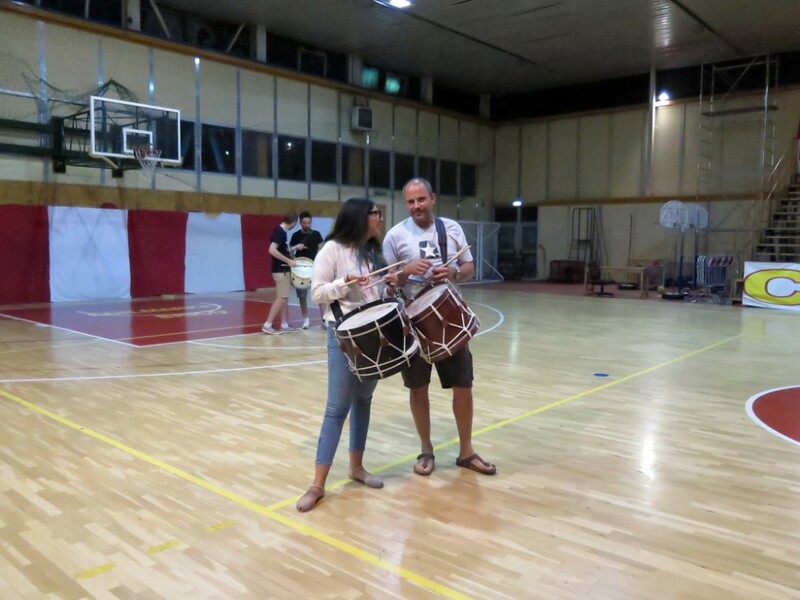 Older drums, like Antonella’s, are decked with colorful rims and distinctive emblems, while newer ones are plain but offer superior sound quality. “Designs on older drums symbolize Cagli’s four neighborhoods, ” offers Alberto, who wears a Stay Fly t-shirt and brown wayfarer glasses. Sant’Angelo, Sant’Agostino, San Francesco, and Sant’Andrea: Each neighborhood is named for its patron saint. 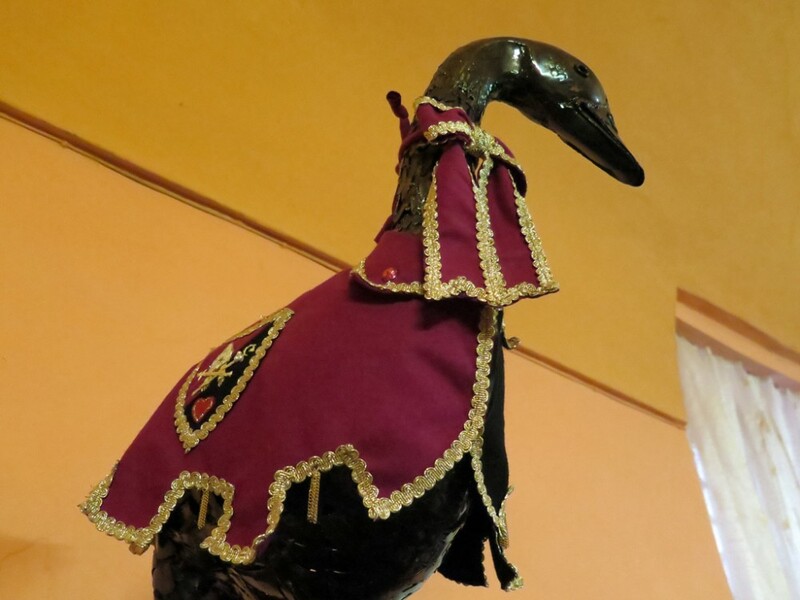 “In the Palio, neighborhoods vie to win the Gioco dell’Oca, the game of the goose,” Alberto explains. “The roll of the dice determines the winner, but games like archery, tug-of-war, races, keg rolling, and our drum competition make it exciting.” The winning neighborhood’s tavern displays the golden goose—actually a wrought-iron sculpture—dressed in the winner’s regalia. At 9:00 p.m. Adamo, a sturdy man in a white t-shirt and brown shorts, unlocks the gym door. 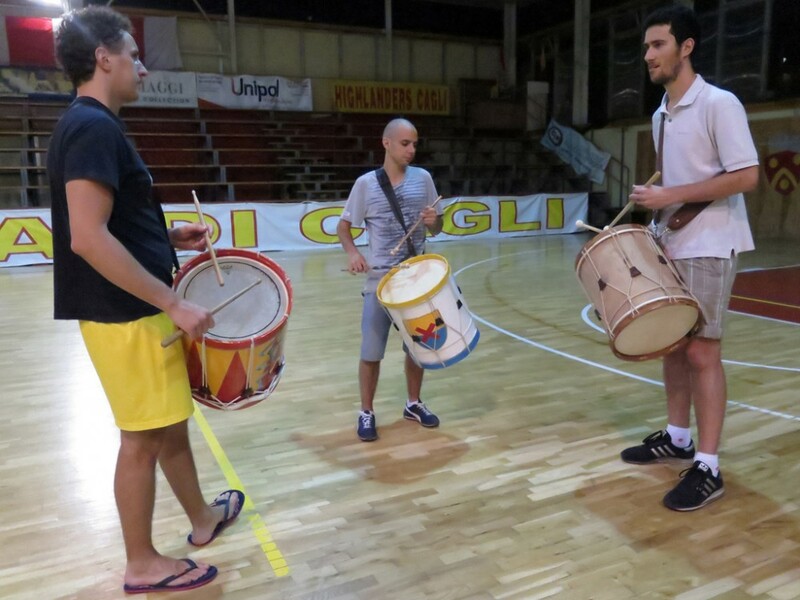 In the past, the neighborhoods practiced alone but this year La Compagnia was formed, uniting drummers from all four neighborhoods. Fanning out in a circle, the drummers sling wide, leathery straps over their shoulders. Drumsticks perched at the ready, they eye Adamo as he strikes a staccato rhythm: tap-tap, tap-tap tap, tap-tap-tap tapa-tapa tapa-tapa. The others match the cadence, forming smaller circles to face one another. Sound ricochets off gym walls and teeth chatter with the pulsing vibrations. When the song ends, Elisa, Adamo, and a blond-braided drummer in a red-and-white dress listen to a song on a smartphone. Adamo plays a sample and again, the sharp rapping of drums consumes the dank gym. 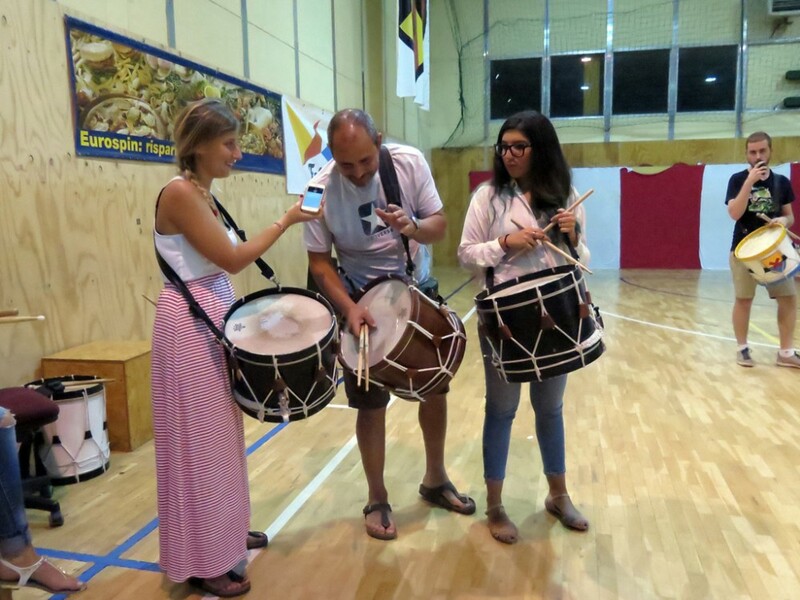 Tonight, the drummers sport an assortment of modern wardrobe pieces—t-shirts, shorts, jeans, and casual skirts—but for the Palio, they’ll don velvety coats with matching skirts or pantaloons and blouses in complementary shades. Neighborhood costumes bear distinctive colors and crests: S. Andrea’s blue and yellow, S. Francesco’s red and green, S. Agostino’s pink and black, and S. Angelo’s red and blue. 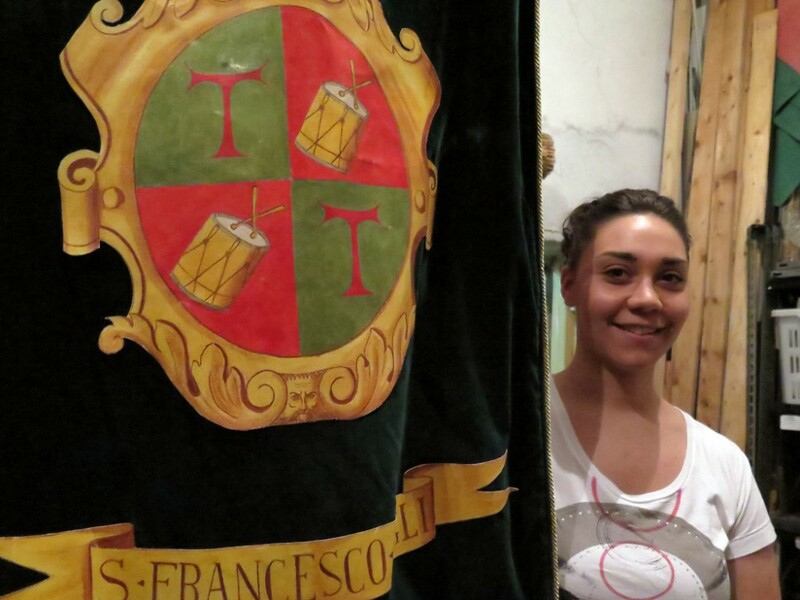 “I love the Palio because it is unique to Cagli and it involves the whole town,” Elisa declares. At 10:00, drum straps slip off tired shoulders. A month before the Palio, pressure is light. Yet, the excitement is palpable. 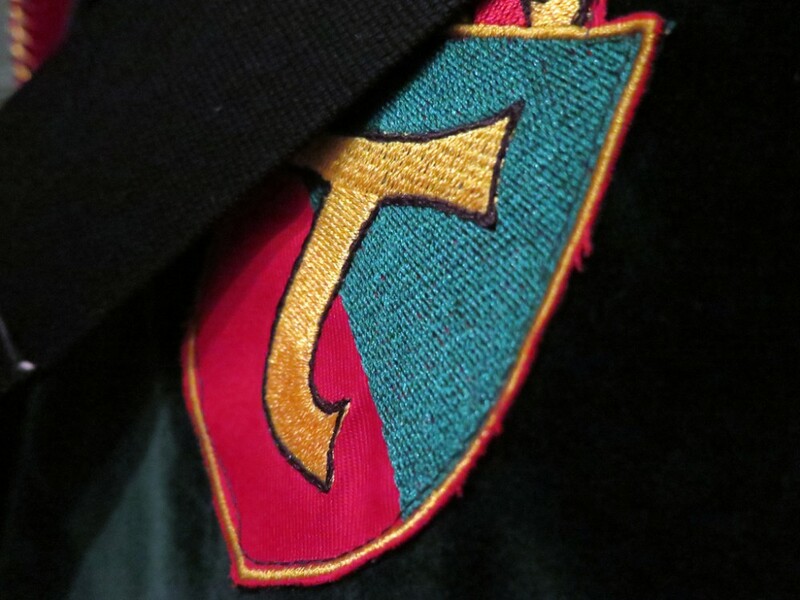 “The Palio is indescribable—there is so much to it,” Alberto asserts. Antonella, Matteo, Martina, Chiara, and Sara nod in agreement. Artfully blending tradition with modern attitudes and technology, La Compagnia defines a style that is Cagli’s alone. 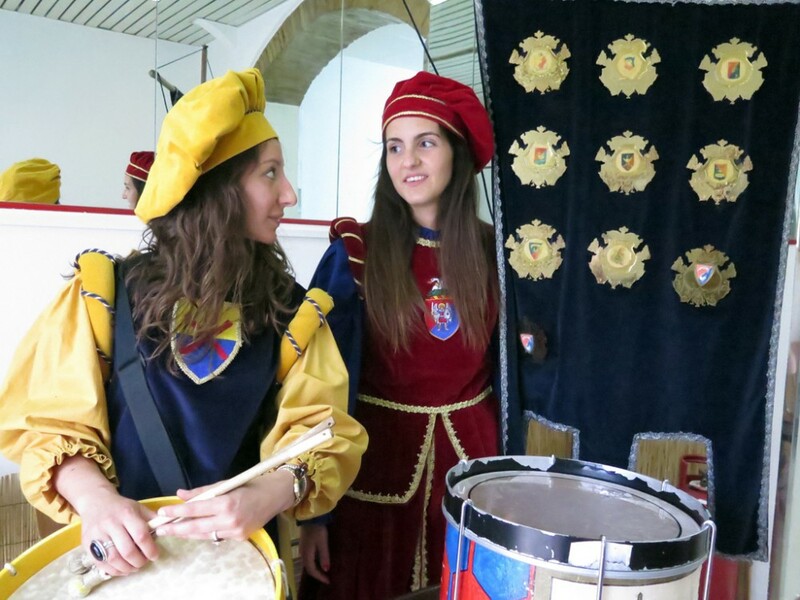 The sights and sounds of their practices and the costumes they’ll wear provide a taste of the grand times to come when Cagli erupts for the Palio.